I was very excited for these books when I heard they about them, magic and assassins together in one, everything about it seemed so intriguing. I expected the books to be very action packed and full of adventure for readers, sadly I was a bit disappointed with what I ended up getting from these books. The covers of these books offers up a dark story with a fantasy feel to it (I kind of thought Lord of the Rings when I saw these covers to be honest lol). 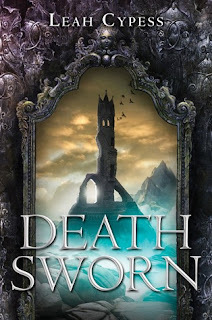 Death Sworn is the first book of this series and introduces us to Ileni who has grown up in the world of magic, but as she has gotten older she has started to lost her magic and she ends up being sent to be a tutor of magic to the assassins. Ileni begins her own mission, now that she is stuck in these caves, to find out what happened to the last two tutors that were there before her. With this I was expecting a lot of action to happen, especially with such a dark idea behind the book, but sadly I was left a bit disappointed, it seemed that the magic and action kind of fell by the wayside (though there was a bigger story that did keep me somewhat interested). 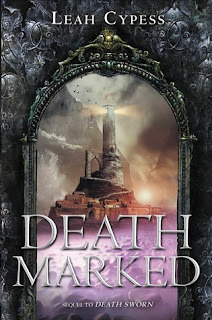 I wanted to know what really happened to the tutors, and to find out what the assassins are really after, Ileni soon learns that everything she was taught may not actually be the whole story. I enjoyed Ileni's insistence on finding the truth and that is what kept me going through this series. Ileni is strong and she is devoted to making a difference, even if it means giving up everything she loves. Ileni learns very quickly that not everything is true and her whole belief system comes crashing down around her. Death Marked picks up a little while after the events of Death Sworn and this book gives readers a view of the other side. This is what really makes this series so hard for me, this one had a bit more of the magic aspect and yet it wasn't really the main focus. The main focus is the rivalry between the assassins and the Empire, but which side is truly right and which side is the villain? I will say that I liked how this one had a little more action to it and readers are able to learn a little more of how the Empire works. It was great to see both sides of the coin in this series because it really gives Ileni (and readers) a lot to look at and have them make the decision of what is actually right. I also felt that this was still similar to the first book, Ileni is learning a new culture and everything she has been taught is being turned on it's head. The biggest disappointment for me was actually the ending... I felt like nothing truly got resolved and it left so many questions up in the air. Where do Ileni's loyalties truly lie, and what exactly happened between the assassins and the Empire. This series had a lot of potential I think for me though it really missed the mark, despite some interesting storylines, there was sometimes a bit too much focus on the romance than other things. It just did not end up working for me.